Meal options on the average train are fairly limited, and you definitely shouldn't expect gourmet meals on a train. Short-distance overnight trains usually have no catering facilities at all; passengers are expected to have already dined before boarding the train; and if not, should have packed food of their own to eat on the train. For example, the Chennai - Mettupalyam Nilgiri Express that leaves Chennai at 9.15 pm, reaching Mettupalyam at 6.15 am has no catering at all, barring a few chai vendors at Coimbatore station. A rule of thumb that you could follow is this: if a train leaves its origin after (an early!) dinnertime, say around 8.30 or 9 pm, and reaches its destination before 7.30 - 8 am, it is unlikely to have onboard catering facilities. While there are exceptions to this "rule", it doesn't hurt to play safe and carry your own food to the train. If you aren't in a position to get yourself a packed meal in advantage, most medium-sized to large stations should have a small refreshment room or restaurant. Daytime intercity trains and long-distance trains manage catering in one of two ways. Through a pantry car: A pantry car is a coach of the train in which food is cooked and kept warm. Pantry cars are not restaurant cars; you cannot plan a leisurely lunch in one. Only one Express train in the country (the Deccan Queen Express between Pune and Mumbai) has a dining car at the moment. 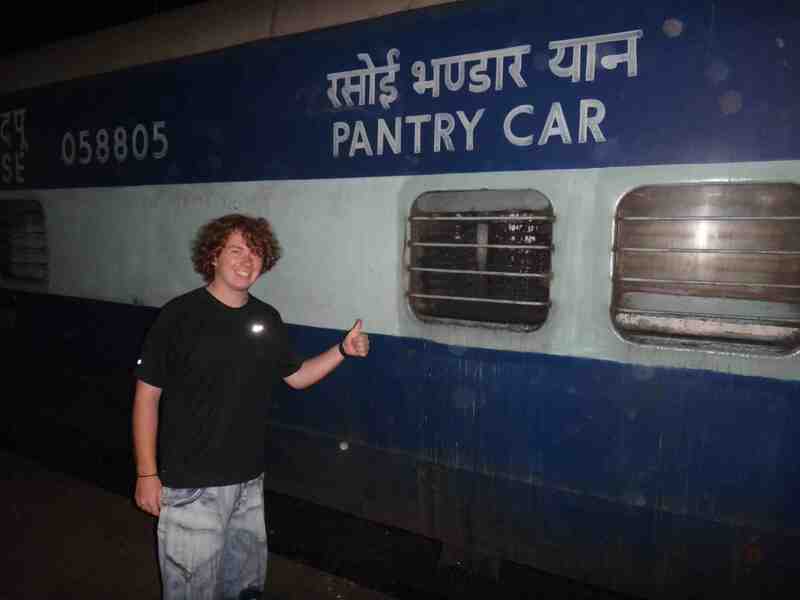 I do not appear to have a photo of a pantry car in my archive, so for the moment will use this photo I found on the blog Ludwig Journey. Incidentally, the post in which I found this picture narrates the author's experience with the railways, and is well worth a read. Some pantry cars offer a far larger selection than this, the Mandovi and Konkan Kanya Express between Mumbai and Goa offer a wide range of tasty snacks and meals. To sum up, the quality of food dished out by pantry cars can vary widely based on the contractor operating the pantry car in question, but on average, the quality of meals served by pantry cars tends to be rather unimpressive. Through food loaded at stations: Many trains run without pantry cars. This is not to say that they lack catering, though; rather that alternative measures are taken to see that food reaches hungry passengers. You should still find vendors patrolling the train with snacks, albeit less fresh than ones prepared by a pantry car. Before mealtimes, an attendant will appear to ask you if you'd like breakfast (or lunch/dinner, depending on the meal in question) and list out the options available - usually limited to "veg" and "non-veg". Food will be loaded at an upcoming station and given to you. You could also just carry the schedule of your train with you, so you'd know which stations the train stops at long enough to forage for food. As train and station food can be quite insipid, a few websites have sprung up to improve the gastronomic experience of the average passenger. Merafoodchoice and Travelkhana both allow you to enter your PNR or train number and - at certain stations - have food delivered to your seat by restaurants in that city or town. Also do check out the thread on Indiamike about stations famous for specific food and this blog post by Sridhar Joshi on food and the Indian Railways. India Rail Info is a good resource to find out what the catering scene is like on your particular train. On clicking on the correct train, the box will change to grey, and will display the name and number of your train. Hover your mouse over the box and select the option "Time-Table"